This building was built in 1900 as an Universalist Church in Americus, Georgia. 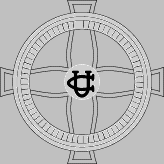 There was a long history of Universalism in the area. Indeed among the founders of the Plains of Dura were Universalists (and an Universalist minister). When the town moved and changed its name to Plains, a new Universalist Church was built there as well. Rev L. F. W. Andrews lived his last few years in Americus (1870s) , and we know that Rev. C.F.R. Shehane had a debate in town in the 1850s. We know that the Christian Scientists were in the building in the 1910s (the city directory states they and the Universalists were both there). In the late 1920s, the building was sold to the Christian Church (Disciples of Christ), who added the Sunday School building and changed the windows (and later added air conditioning). They last met in circa 1998/1999. as of 2011, the building is being used by the First United Methodist Church as their Spanish Language Mission. The last known Universalist Church service in Americus was circa 1930 by the Rev. Stanley Manning.